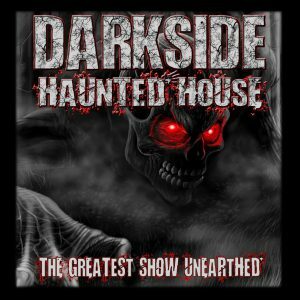 Darkside Haunted House is a Haunted Attraction located in Calverton, NY. 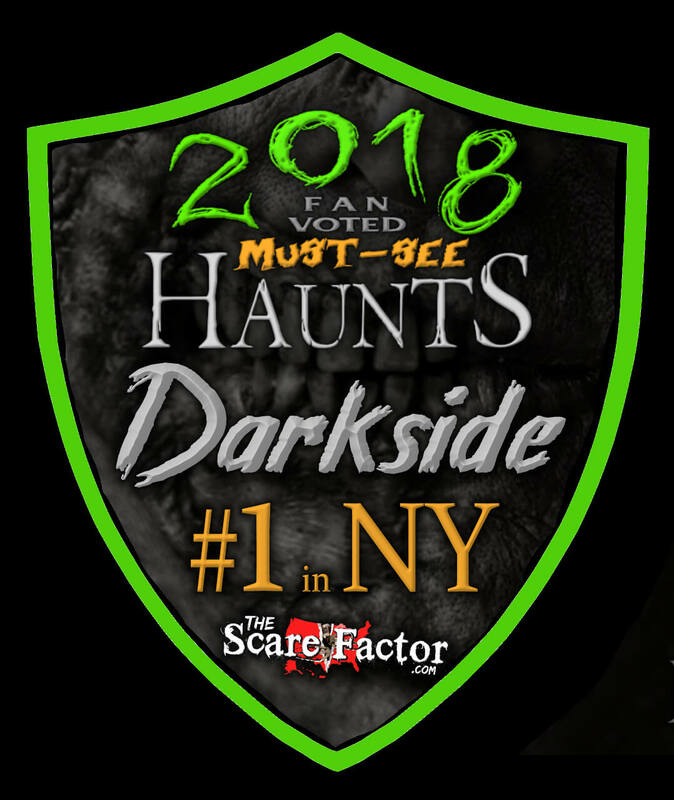 Team Crypt Creepers reviewed this attraction on October 18, 2017. Put your milk away, cuz this Darkside doesn’t have cookies. No, they have quite the opposite. Horrors and terrors fill this haunt, which make it live up to it’s theme of Night Terrors. These grizzly ghouls are looking for some new prey, and if you are brave enough to venture up to Wading River, New York, then you may very well find yourself wading through the blood and bones of those who have dared try before you, only to realize the further in you go, the deeper in trouble you find yourself. Do you dare take a walk on the darkside? Some of the liveliest ghouls around roam this haunt, bringing to life the roles they portray. Be it a wailing victim, or a hissing spider person. The cast is a diverse mix from subtle greeters to hellbent hillbillies. They all worked amazingly with their surroundings, taking full advantage of various hidey-holes and secret doorways, as well as props and sets. A number of cast members really stand out. They included Mr. Z, the main greeter who kept guests entertained as they waited in line while still providing rules and guidelines, ”The daughter,” who eagerly awaited someone to play with her, “The fence guy” who listened to guests as they passed by and timed his scares purposely for maximum effect, incorporating what he heard to really creep out guests after the initial scare and “The nurse” who looked like she was ripped right out of a WWII era infirmary and had such an icy stare that it stopped me in my tracks. The main costuming theme used throughout this haunt seemed to be “ghoul.” Pale faces with dark lines and shadows made these living people look more ghostly, rather than gruesome, which is different than many other haunts. Don’t get me wrong though, the victims were bloody messes, which of course fit the scenes and the characters, and a few masked monsters prowled the grounds as well, giving a well-rounded feel to the costume choices. All of the costumes were complete and well put together. Down a dark and winding road sits a sinister looking façade with a demon on top. His wings flapping in the chilly autumn air. A hearse is parked on the lawn, waiting for the haunt to provide it its next “Customer.” A worker helps guide guests into the parking lot, while Halloween music plays out front. Out back there is a wide expanse of open land, open sky, and a creepy silence broken only by the screams of guests in the haunt. You can definitely tell you are at a haunt. Mr. Z provides the line entertainment, asking guests riddles, finding out their names and other information and overall just messing with the guests, all the while in a very sinister and grin-grinning way. A few other ghouls pop their heads out for fun banter with guests, or just to stare occasionally. The staff here are extremely friendly, talking with guests occasionally as they exit. The haunting façade definitely made sure you knew you were at a haunted house. The music that played was a mix of covers of Halloween classics, and rock music, which got the blood going, and the heart racing. The lighting by the entrance arches was dim and creepy, and as you wait to enter, you get to marvel at their lost and found fence, which is covered in items that once belonged to guests, who may or may not have escaped the Darkside’s clutches. The scaractors aren’t the only things to be afraid of, as you navigate this haunt. Impressive animatronics and realistic sounds also terrify guests who venture forth. The sounds of spiders crawling and pigs squealing add a creep factor, as the lunging animatronics threaten to assault you. A shaking elevator with a surprise guests chills you, a spark grate shocks you (not literally), and the lighting throughout is enough to let you see just enough of the danger before it is too late to save yourself. The theme for Darkside is “Night Terrors,” and it is definitely chocked full of them. From spiders to clowns, this haunt is full of things that keep people up at night, or make them wake up screaming. 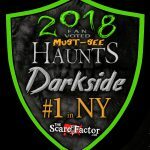 Deadly doctors, living scarecrows, and things that lurk in the dark all wait for unsuspecting guests, who may want to check under their beds before they go to sleep…if they get out that is. Hidden doors and hidey-holes are everywhere in this haunt, meaning that most of the time you won’t see the scare coming. If you do, you are most likely being set up for a bigger scare to come. This meant that most of the scares were unpredictable and very effective. The use of distractions is great, and the scaractors work very well with each other. They also made sure to spread their scares across the group. We caught the tail end of the finale, as they scared a different group, but you can’t go wrong with a clown with a chainsaw! On average, this haunt takes about 22 minutes to get through. A twisting, winding path that takes you through terrors from deep in your psyche await those who choose to trust their lives to these ghouls. $30 gets you in, $40 gets you passed the line and with Halloween coming, the $40 option is the better bet.